On January 1, 2016, China changed its family planning policy and allowed every couple to have a second child. That year, the nation welcomed 13.1 million more infants than in 2015. Three years have passed, and although the birth rate has fallen since, over 50 percent of newborns have been second children each year. A mother of two kids will face more challenges and pressures than ever. To continue to work or become a full-time housewife? How to balance work and family? Faced with a plethora of trivial matters, how does a mother retain her own identity? How do you balance the needs of two kids at the same time? Each question is a big deal. 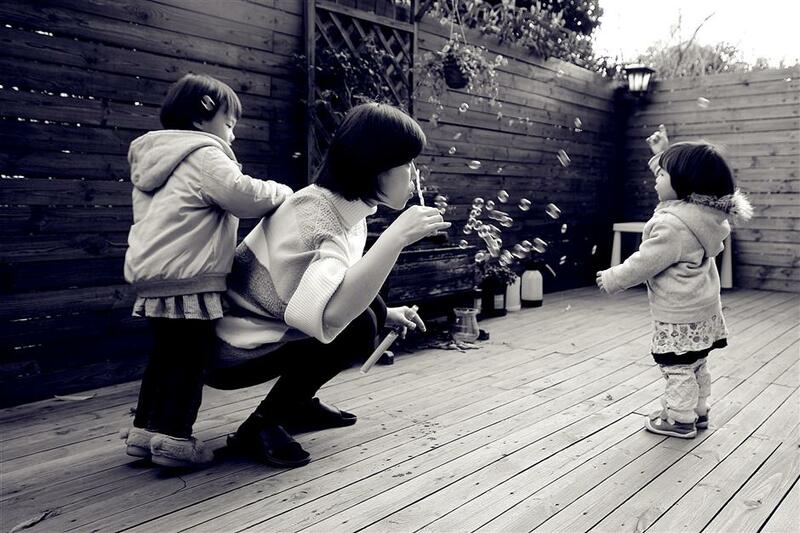 We talked to some mothers in Shanghai who have second children about their joys and their worries. If you are a mother of two kids and would like to share your story with us or you have a friend with a second child, please contact us at wanghaoling@shine.cn. Shot by Ma Xuefeng. Edited by Zhong Youyang. Subtitles by Holin Wang, Wang Xinzhou and Andy Boreham. When Daisy found she was pregnant again, her first child Qianqian was eleven months old. Qianqian had been sleeping alone in her room since she was six months old. It's not for the family to meet the kids' needs, but for the kids to fit in with the family. Three years ago, Daisy was a designer in an architect's office. After having Qianqian, she went part-time, working only three days a week. They prepared financially to ensuring one salary would be enough for the whole family and took out a low mortgage to ease the pressure. Usually on weekdays, Daisy spends all her time with her daughter at home. 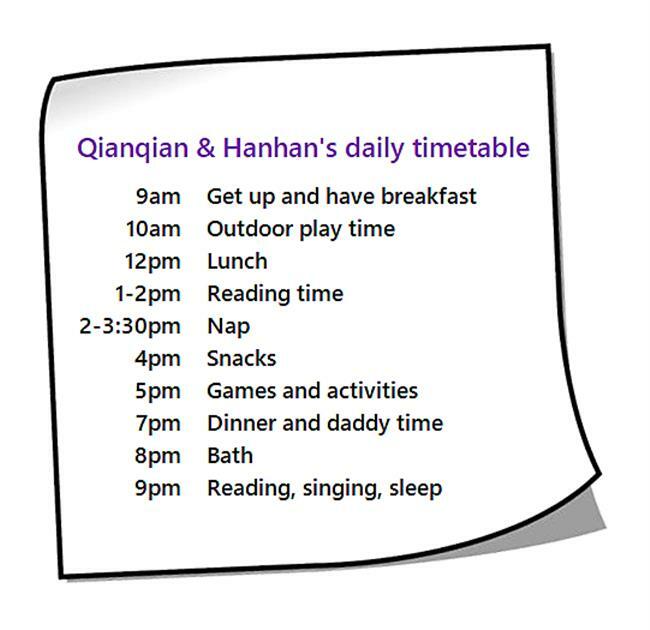 They have a timetable for eating, playing and sleeping. Daisy expects her daughters to form good habits. When it’s time to eat, Daisy just helps her daughters to put on their bibs and puts their food in front of them. They concentrated in eating silently themselves. Daisy can enjoy her own food. When it’s time to sleep, the two girls go to bed and stay in their room themselves, giving Daisy time to do some housework. Daisy might seem to be a very chilled mother, with two angelic children, but she also has her troubles. The first three years of a child's life are much more important than anything I could do in the same three years of my thirty-more-year career. As a full-time mom, Daisy takes care of two daughters all day during the week. Her husband helps after work. An ayi comes to clean for two hours a day. Her mother and her mother-in-law each help out two days a week. Daisy knows that it is important for a stay-at-home mother to moderate any of her bad moods into good ones. She knows how to relax, dining out with colleagues or meeting friends on weekends to get a break from the family atmosphere. She has also made friends with mothers living nearby who face the same issues. Daisy blows bubbles for her two kids. The husband’s attitude towards family is important for a stay-at-home mom. 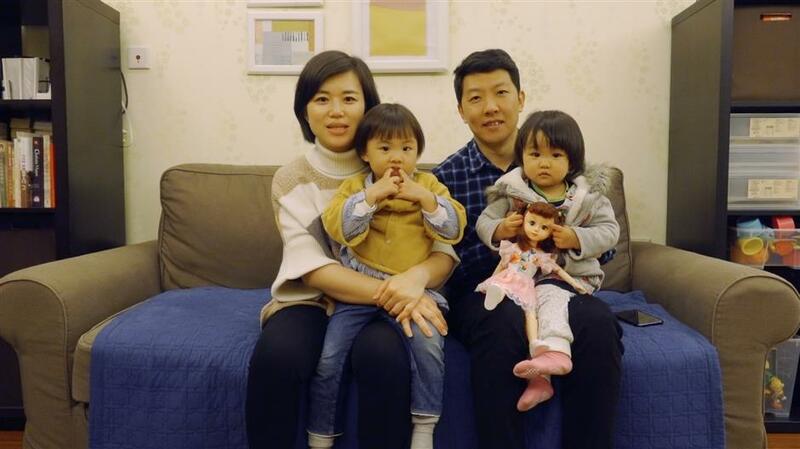 Daisy and her husband Yu Bing came to an agreement that he would try his best to stay at home and be with the kids after work. Bing works nine to five as a network engineer, and sometimes he works overtime or goes on business trips. He plays with the kids, helps them to have their bath and tells them stories after dinner every evening. Like any other couple, Daisy and Bing quarrel sometimes. Daisy’s way is not to express her needs to him in a critical way. She waits till the coming weekend when they can spend some time alone together and share their expectations. “Dating with your husband is also a good way to relax,” said Daisy. Daisy picks a picture book for her elder daughter while the younger amuses herself in her chair. 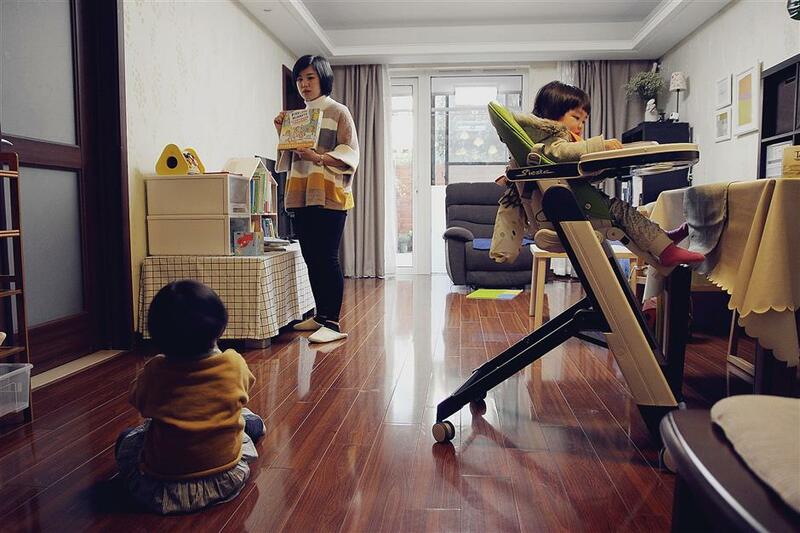 Before Hanhan was born, Daisy showed Qianqian many picture books on second children and families. She also brought a small bed and told Qianqian “This is for the new baby,” hoping her elder daughter could welcome the little one. Daisy said that on their first meeting at home, Qianqian asked her to show her younger sister the small bed and made her comfortable there. 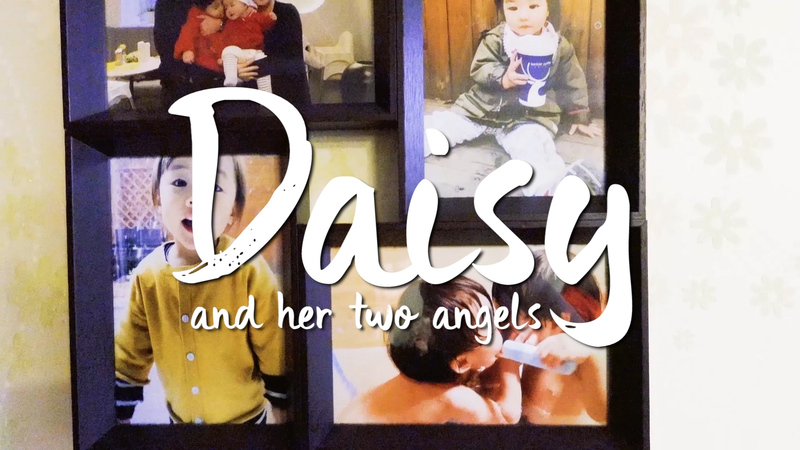 Being a full-time mom for more than two years, Daisy confesses that she sometimes doubts herself, but everything can be conquered when she sees her two daughters growing up happily. Daisy holds her Qianqian while her husband, Yu Bing, holds Hanhan.